Ripple has suddenly turned very green after Swift announced they are undertaking a proof of concept trial with R3 to link the latter’s Corda to Swift’s payment system. “With the gpi Link, banks will be able to provide rapid, transparent settlement services to e-commerce and trading platforms, opening up whole new ecosystems to the speed, security, ubiquity and transparency of gpi and enabling them to grow and prosper in the new digital economy. Corda is a private blockchain of sorts mainly focused on facilitating fiat bank transfers through distributed ledgers to increase speed and efficiency. “When a payment obligation arises on Corda during the course of business, one party now has the option to request settlement using XRP. 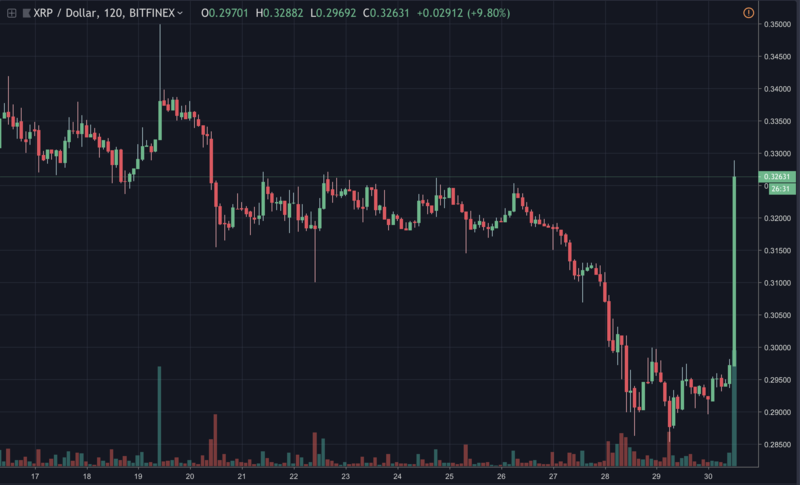 XRP jumps on Swift PoC with R3, Jan 2019. Ripple aims to create a system whereby XRP acts as a sort of messenger. A bank in UK, for example, can buy XRP and send that to a bank in Brazil which then converts it into Brazilian money. In this way the transfer could happen a lot quicker as it is effectively the blockchain that keeps accounts, rather than somewhat centralized databases that sometime require manual intervention to check who owns what. The above can work with any crypto, but XRP has tried to carve that niche for itself, creating systems that make such transfers easier. R3’s connection to Swift however might make the XRP part irrelevant because they could effectively blockchenized fiat with the dollar itself then being sort of like XRP. In which case they could bring international payment fees and processing times down to seconds, so making XRP irrelevant. Yet the design would be trusted. The banks could and of course will print as many tokenized dollars as they please and no one needs know of it except for the participating banks. The lack of open source code may make them vulnerable to hacking from within or from the outside. The lack of smart contracts may make it boring from a coding perspective. And the closed nature might significantly slow down any innovation within their systems. On the other hand they are at least trying to compete, but if they do succeed in streamlining international payments it isn’t very clear how XRP can maintain any relevance. While BTC or BCH can claim gold status, eth can brag about giving machines bank accounts through smart contracts that don’t need private keys and even stablecoins – at least some of them – can brag about being open rather than in a closed system.